The TVT (Tarbut V’ Torah) campus is a focused environment that promotes interactive learning for both the indoor and outdoor spaces. With the addition of new MAKER + science, STEAM and Fitness buildings the re-imagined campus exterior promotes the ability for learning to happen anywhere. Established in 1991, TVT is an existing 21.5-acre K-12 community day school in Irvine, CA. This project expands on the original site, bringing the facilities and exterior spaces in-line with today’s 21 century educational and instructional needs. TVT embraces a landscape of innovation and incorporates sustainable water quality BMP’s seamlessly into the site design while providing educational opportunities for students and visitors. The newly re-imagined campus exterior is a place that inspires, allows for reflection, provides opportunities for exploration, and provides educational BMP opportunities. The design team was challenged to update an existing campus to support the emerging ‘MAKER’ and STEAM curriculum. Redesigned exterior spaces were necessary for opportunities for outdoor learning. The design team reached above stormwater permit requirements and brought water quality into an educational experience for students, visitors, and faculty. Green roofs, bioretention, proprietary biofiltration, and swales were constructed to create a living machine at TVT. Educational signage was placed to inform and educate as students interact with the BMP’s which were merged seamlessly into the campus. The design team engaged project stakeholders through design charrettes engaging students and faculty to guide the design. A close working relationship between the design team and stakeholders accomplished marrying an existing campus with new exciting indoor and outdoor learning experiences. Design challenges included working within an existing built campus and merging proposed improvements into a built environment. Challenges included significant topographic differences and large building pads to accommodate, existing utilities to relocate, providing fire access, meeting stormwater regulations in tight spaces with existing storm drains connections. The challenges continued through construction as utilities were installed incorrectly and did not account for the proposed grade changes. Redesign of outdoor spaces occurred rapidly to preserve newly constructed utilities and provide the outdoor space and activities to inspire students and faculty. o	Divided into three topographic levels, the school is broken into grade levels K-5, 6-8, and 9-12. The lower campus extends learning outdoors by providing students with a new amphitheater, growing grounds and farm, writable surfaces, outdoor art courtyard, interactive water play creek and new play structures selected to challenge the students and promote health and learning. Traditional playground features such as basketball half-courts, four square courts and ball walls were also included, providing plenty of options to stay active and enjoy the outdoors. o	The new upper campus STEAM building houses hands-on learning labs, black box, and specialized engineering programs. The upper school quad adjacent to the new building provides: small group pods, an amphitheater and stage, evening performance lighting, lunch terrace, 18’ long concrete work bench table, and a roof top huddle deck. The quad complements the building programs with diverse spaces for students to meet and explore new ideas. o	TVT believes that ‘joyful learning today leads to meaningful achievements tomorrow”. The outdoor landscape spaces now provide for the students to exemplify the school’s values and promote Joyful Learning that can happen anywhere. The Tarbut V’ Torah campus is a focused environment that promotes interactive learning for both the indoor and outdoor spaces. With the addition of new MAKER + science, STEAM and Fitness buildings the re-imagined campus exterior promotes the ability for learning to happen anywhere. o	The TVT (Tarbut V’ Torah) campus is a focused environment that promotes interactive learning for both the indoor and outdoor spaces. With the addition of new MAKER + science, STEAM and Fitness buildings the re-imagined campus exterior promotes the ability for learning to happen anywhere. 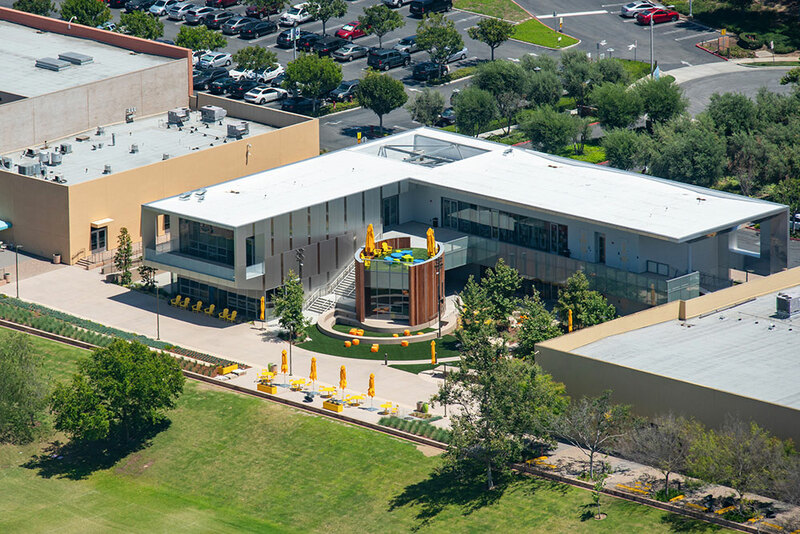 Established in 1991, TVT is an existing 21.5-acre K-12 community day school in Irvine, CA. The project expands on the original site, bringing the facilities and exterior spaces in-line with today’s 21 century educational and instructional needs. TVT embraces a landscape of innovation while marrying two goals: using the outdoors as a seamless extension of the learning spaces and proudly telling a story that runs deep and is aligned with the educational goals of the community. The newly re-imagined campus exterior is a place that inspires, allows for reflection, provides opportunities for exploration, and shares the culture of Israeli people to new generations. The design team reached above stormwater permit requirements and brought water quality into an educational experience for students, visitors, and faculty. Green roofs, bioretention, proprietary biofiltration, and swales were constructed to create a living machine at TVT. Educational signage was placed to inform and educate as students interact with the BMP’s which were merged seamlessly into the campus.